This article is about the Elizabethan soldier and courtier. For other people of the same name, see Edward Denny. The monument to Sir Edward Denny and his wife Lady Margaret, with "weepers" depicting their seven sons and three daughters. Sir Edward Denny (1547 – 12 February 1600), Knight Banneret of Bishop's Stortford, was a soldier, privateer and adventurer in the reign of Elizabeth I.
Bishop's Stortford is a historic English market town and civil parish in Hertfordshire, just west of the M11 motorway on the county boundary with Essex. It is the closest sizeable town to London Stansted Airport, 27 miles (43 km) north-east of Charing Cross in central London, and 35 miles (56 km) by rail from Liverpool Street station, the London terminus of the line to Cambridge that runs through the town. Bishop's Stortford had a population of 38,202 in 2001, easing to 37,838 at the 2011 Census. High Sheriff, Knight and M.P. Denny was born in Cheshunt, Hertfordshire in 1547, the second surviving son of Sir Anthony Denny who was a Privy Councillor to Henry VIII and one of the Guardians of Edward VI. Orphaned in childhood, he inherited lands in Hertfordshire. After some minor appointments at court, in 1573 Edward Denny went to Ulster on a military expedition led by Walter Devereux, 1st Earl of Essex. Denny then took up privateering, capturing a Spanish ship in 1577 and a Flemish one in 1578. The same year saw him join a colonizing expedition led by Sir Humphrey Gilbert and Walter Raleigh; however, their ships were forced to turn for home by bad weather. Sir Anthony Denny was a confidant of King Henry VIII of England. Denny was the most prominent member of the Privy chamber in King Henry's last years, having together with his brother-in-law, John Gates, charge of the "dry stamp" of the King's signature, and attended the King on his deathbed. He also served as Groom of the Stool. He was a member of the Reformist circle that offset the conservative religious influence of Bishop Gardiner. He was a wealthy man, having acquired manors and former religious sites through the Court of augmentations. By 1548, he was keeper of Westminster Palace. Walter Devereux, 1st Earl of Essex, KG, was an English nobleman and general. 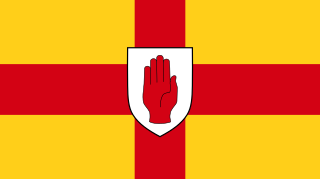 From 1573 until his death he fought in Ireland in connection with the Plantation of Ulster, where he ordered the Rathlin Island massacre. He was the father of Elizabeth I's favourite of her later years, Robert Devereux, 2nd Earl of Essex. Denny and his cousin Raleigh were then sent to Ireland to help put down the Second Desmond Rebellion. Denny led a company at the infamous Siege of Smerwick, when 400 Spanish and Italian troops were beheaded by the English after surrendering. In 1581, he commanded another expedition to Ireland and returned with the head of Garret O’Toole, leader of one of the Irish clans. 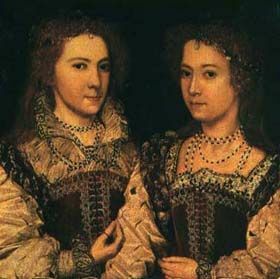 At court that year, he met Lady Margaret Edgcumbe, one of the queen’s maids of honour, and married her in 1583. They had seven sons and three daughters. The Second Desmond Rebellion (1579–1583) was the more widespread and bloody of the two Desmond Rebellions launched by the FitzGerald dynasty of Desmond in Munster, Ireland, against English rule in Ireland. The second rebellion began in July 1579 when James FitzMaurice FitzGerald landed in Ireland with a force of Papal troops, triggering an insurrection across the south of Ireland on the part of the Desmond dynasty, their allies and others who were dissatisfied for various reasons with English government of the country. The rebellion ended with the 1583 death of Gerald FitzGerald, 15th Earl of Desmond, and the defeat of the rebels. The Siege of Smerwick took place at Ard na Caithne in 1580, during the Second Desmond Rebellion in Ireland. A 400–500 strong force of Papal soldiers captured the village but were forced to retreat to nearby Dún an Óir, where they were besieged by the English Army. The defenders eventually surrendered and most of them were then massacred on the orders of the English commander, The 14th Baron Grey de Wilton, the Lord Deputy of Ireland. Mount Edgcumbe House is a stately home in south-east Cornwall and is a Grade II listed building, whilst its gardens and parkland are listed as Grade I in the Register of Parks and Gardens of Special Historic Interest in England. Liskeard was a parliamentary borough in Cornwall, which elected two Members of Parliament (MPs) to the House of Commons from 1295 until 1832, and then one member from 1832 until 1885. The constituency was abolished by the Redistribution of Seats Act 1885. 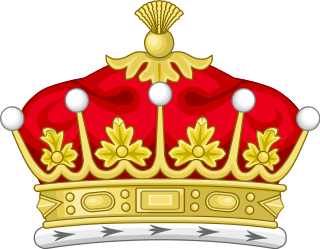 The title of Earl of Desmond has been held historically by lords in Ireland, first as a title outside of the peerage system and later as part of the Peerage of Ireland. Robert Devereux, 2nd Earl of Essex, KG, PC, was an English nobleman and a favourite of Elizabeth I. Politically ambitious, and a committed general, he was placed under house arrest following a poor campaign in Ireland during the Nine Years' War in 1599. In 1601, he led an abortive coup d'état against the government and was executed for treason. The Abbey Church of Waltham Holy Cross and St Lawrence is the parish church of the town of Waltham Abbey, Essex, England. It has been a place of worship since the 7th century. The present building dates mainly from the early 12th century and is an example of Norman architecture. To the east of the existing church are traces of an enormous eastward enlargement of the building, begun following the re-foundation of the abbey in 1177. In the Late Middle Ages, Waltham was one of the largest church buildings in England and a major site of pilgrimage; in 1540 it was the last religious community to be closed during the Dissolution of the Monasteries. It is still an active parish church for the town. Sir Edward is interred in the family vault in the churchyard,  Lady Margaret Denny lived on until 1648 and is buried in St Michael's Church, Bishop's Stortford. 1 2 N.M.S. "DENNY, Edward (c.1547-1600), of Bishop's Stortford, Herts. and Tralee, co. Kerry". www.historyofparliamentonline.org. The History of Parliament Trust. Retrieved 28 March 2014. Earl of Essex is a title in the Peerage of England which was first created in the 12th century by King Stephen of England. The title has been recreated eight times from its original inception, beginning with a new first Earl upon each new creation. Possibly the most well-known Earls of Essex were Thomas Cromwell, chief minister to King Henry VIII, and Robert Devereux, 2nd Earl of Essex (1565–1601), a favourite of Queen Elizabeth I who led the Earl of Essex Rebellion in 1601. Charles Blount, 1st Earl of Devonshire, KG was an English nobleman and soldier who served as Lord Deputy of Ireland under Queen Elizabeth I, then as Lord Lieutenant of Ireland under King James I. Sir Anthony Cooke was an eminent English humanist scholar. He was tutor to Edward VI. Knollys, Knolles or Knowles, the name of an English family descended from Sir Thomas Knollys, Lord Mayor of London, possibly a kinsman of the celebrated general Sir Robert Knolles. The next distinguished member of the family was Sir Francis Knollys or Knowles, English statesman, son of Sir Robert Knollys, or Knolles, a courtier in the service and favour of Henry VII and Henry VIII. Robert had also a younger son, Sir Henry, who took part in public life during the reign of Elizabeth I and who died in 1583. From the time of Sir Francis, the family were associated with Greys Court at Rotherfield Greys and Caversham Park, then in Oxfordshire, as well as the nearby town of Reading in Berkshire, where the family's private chapel could once be seen in the church of St Laurence. 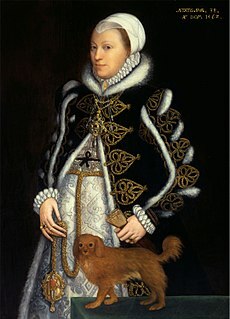 Dorothy Percy, Countess of Northumberland was the younger daughter of Walter Devereux, 1st Earl of Essex by Lettice Knollys, and the wife of Henry Percy, 9th Earl of Northumberland. Sir Francis Knollys, KG of Rotherfield Greys, Oxfordshire was an English courtier in the service of Henry VIII, Edward VI and Elizabeth I, and was a Member of Parliament for a number of constituencies. Sir Gelli Meyrick was a Welsh supporter of Robert Devereux, 2nd Earl of Essex, and conspirator in Essex's rebellion. He was executed for his part in it. Sir John Carey, of Plashey was a courtier to King Henry VIII. He served the king as a Groom of the Privy Chamber, and, being a descendant of Edmund Beaufort, Duke of Somerset, John Carey was a third cousin to Henry VIII. Edward Denny, 1st Earl of Norwich, known as The Lord Denny between 1604 and 1627, was an English courtier, Member of Parliament, and a peer. Sir John Watts was an English merchant and shipowner, active in the East India Company and Virginia Company and Lord Mayor of London in 1606. Peter Edgcumbe or Edgcombe was an English politician. Thomas Gerard, 1st Baron Gerard was a Staffordshire and Lancashire landowner and politician, a member of six English parliaments for three different constituencies. Although a prominent member of the Essex faction in the reign of Elizabeth I, he avoided involvement in the Essex Rebellion and received greater honours, including a peerage, in the reign of James I. Sir Edward Waterhouse (1535–1591) was an English-born Chancellor of the Exchequer of Ireland from 1586 to 1589 and Chief Secretary for Ireland from 1566 to 1567 and again 1568 to 1569. Sir Anthony Ashley, 1st Baronet, PC was Clerk of the Privy Council, which was the most senior civil servant in the Privy Council Office. Ashley accompanied the fleet to Cádiz as a representative of the Queen. He distinguished himself by the capture of Cádiz and was knighted by Robert Devereux, 2nd Earl of Essex at Cádiz after the capture of the city. 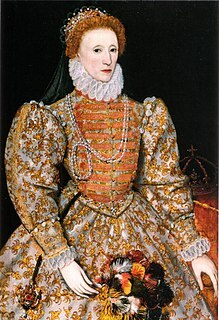 Ashley sat in several parliaments, and was highly distinguished by favor of Queen Elizabeth I of England. Sir John Cutts (1545–1615), of Horham Hall, Essex; Shenley Hall, Hertfordshire and Childerley, Cambridgeshire, was an English politician. Sir Ralph Rowlett, of Holywell House, St. Albans, Hertfordshire, was an English politician.